The Ice-Cap method allows one to grow plants in 96-well plates and non-destructively harvest root tissue from each seedling. DNA extracted from this root tissue can be used for genotyping reactions. We have found that Ice-Cap works well for Arabidopsis thaliana, tomato, and rice seedlings. 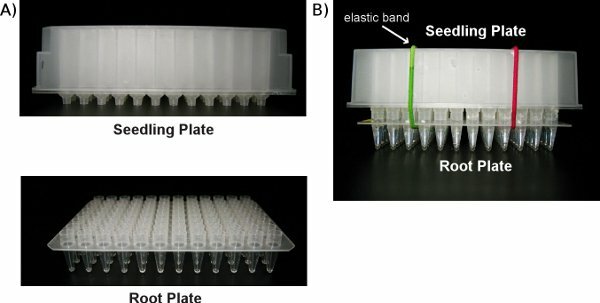 Su, S., Clark, K. A., Gibbs, N. M., Bush, S. M., Krysan, P. J. Ice-Cap: A Method for Growing Arabidopsis and Tomato Plants in 96-well Plates for High-Throughput Genotyping. J. Vis. Exp. (57), e3280, doi:10.3791/3280 (2011). It is becoming common for plant scientists to develop projects that require the genotyping of large numbers of plants. The first step in any genotyping project is to collect a tissue sample from each individual plant. The traditional approach to this task is to sample plants one-at-a-time. If one wishes to genotype hundreds or thousands of individuals, however, using this strategy results in a significant bottleneck in the genotyping pipeline. The Ice-Cap method that we describe here provides a high-throughput solution to this challenge by allowing one scientist to collect tissue from several thousand seedlings in a single day 1,2. This level of throughput is made possible by the fact that tissue is harvested from plants 96-at-a-time, rather than one-at-a-time. The Ice-Cap method provides an integrated platform for performing seedling growth, tissue harvest, and DNA extraction. 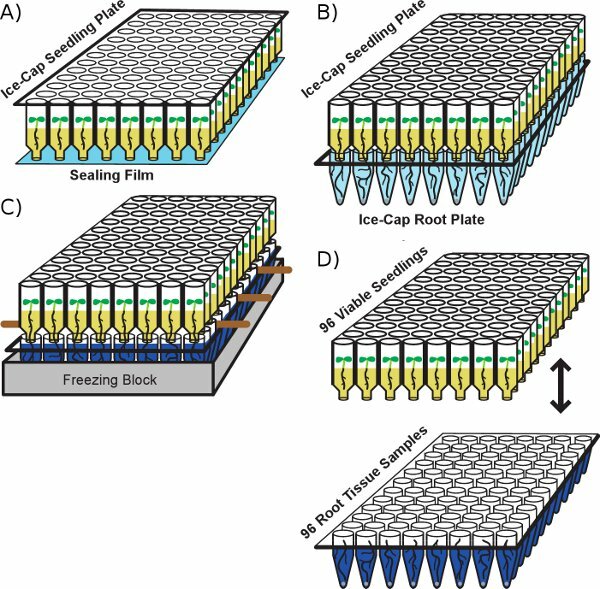 The basis for Ice-Cap is the growth of seedlings in a stacked pair of 96-well plates. The wells of the upper plate contain plugs of agar growth media on which individual seedlings germinate. The roots grow down through the agar media, exit the upper plate through a hole, and pass into a lower plate containing water. To harvest tissue for DNA extraction, the water in the lower plate containing root tissue is rapidly frozen while the seedlings in the upper plate remain at room temperature. The upper plate is then peeled away from the lower plate, yielding one plate with 96 root tissue samples frozen in ice and one plate with 96 viable seedlings. The technique is named "Ice-Cap" because it uses ice to capture the root tissue. The 96-well plate containing the seedlings can then wrapped in foil and transferred to low temperature. This process suspends further growth of the seedlings, but does not affect their viability. Once genotype analysis has been completed, seedlings with the desired genotype can be transferred from the 96-well plate to soil for further propagation. We have demonstrated the utility of the Ice-Cap method using Arabidopsis thaliana, tomato, and rice seedlings. We expect that the method should also be applicable to other species of plants with seeds small enough to fit into the wells of 96-well plates. Molten growth media (0.5X Murashige and Skoog (MS) basal salt mixture, 2 mM Morpholinoethanesulfonic acid (MES), 0.6% agar (w/v), pH 5.7) is dispensed into autoclaved Seedling Plates using a MicroFill Microplate Dispenser. One liter of media is needed per 18 Seedling Plates. Prepare growth media in one liter glass bottles with screw top lids and autoclave for 20 minutes. Autoclave one liter of distilled water in a glass bottle with screw top lid. At the same time also autoclave empty Seedling Plates wrapped in aluminum foil. Transfer the autoclaved media and water to an incubator set at 65°C. This temperature will maintain the growth media in a molten state. After autoclaving, remove Seedling Plates from foil and place in laminar flow hood to dry. Plates must be completely dry before proceeding so that the adhesive packing tape can completely seal the holes on the bottom of the wells of the plates. Wipe down lab bench with 95% ethanol to sanitize. Soak clear plastic lids for the Seedling Plates in 95% ethanol to sanitize. Remove lids from ethanol and air dry in laminar flow hood. Do not autoclave the plastic lids to sterilize them because they will melt in the autoclave. Apply packing tape to the bottom of each Seedling Plate and firmly seal using the roller tool. Place the bottles of molten growth media and sterilized water in a water bath set at 65°C. Attach a bottle containing 70% ethanol at room temperature to the MicroFill machine and run the purge cycle two times to sanitize the plumbing of the MicroFill machine. Attach the bottle with sterile water to the MicroFill machine. Run the purge cycle six times to warm the plumbing and clear the ethanol out of the system. The bottle of water should remain in the 65°C bath throughout this procedure. After completing the purges with sterile water, immediately attach the bottle of molten growth media to the MicroFill machine. Run the purge cycle two times to clear the distilled water out of the plumbing. The bottle of growth media should remain in the 65°C bath throughout this procedure. Dispense 450 microliters of growth media into the wells of each Seedling Plate. Work quickly so that the growth media does not solidify in the plumbing of the MicroFill machine. When all of the Seedling Plates have been filled, immediately attach the bottle of 65°C sterile water to the MicroFill machine and run the purge cycle 12 times to clean the plumbing. The bottle of water should remain in the 65°C bath throughout this procedure. If a MicroFill machine is not available, Seedling Plates can also be prepared by hand-pipetting molten agar into the sealed plates using a multichannel pipettor. Inspect the wells of each Seedling Plates to ensure that the growth media has not leaked out of any wells. Hand pipette additional molten growth media into individual wells as needed. Cover each plate with a clear plastic lid, and allow growth media to solidify in the Seedling Plates at room temperature. Stack plates and wrap in aluminum foil for storage at 4°C. Store plates upside down to prevent water accumulation in the wells during storage. We have previously described a semi-automated method for dispensing Arabidopsis seeds into Seedling Plates using a seed loading device (2). 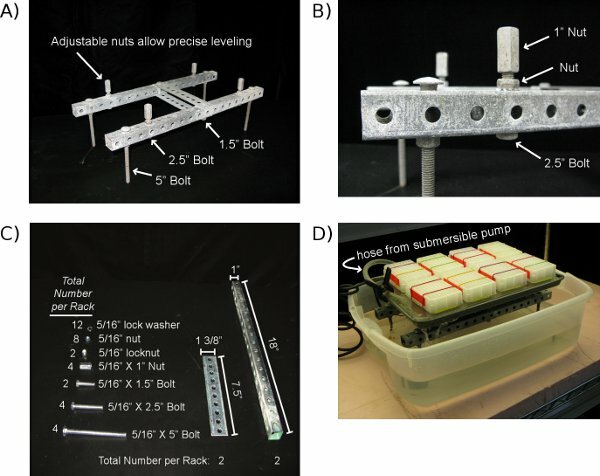 Although this device can be useful for some batches of seed, we have found that the variability in seed size displayed by different batches of Arabidopsis seeds limits the general utility of this device. We are in the process of developing an alternative automated method for seed dispensing, but at present we have found that the most effective strategy for dispensing seeds into the Seedling Plates is to perform this step by hand as described below. Sprinkle dry seeds onto Whatman filter paper. Dispense 95% ethanol onto seeds so that all of the seeds are covered with ethanol. This treatment will surface sterilize the seeds. Allow seeds to air dry. Transfer individual seeds into the wells of the Seedling Plates using a modified disposable glass Pasteur pipette. The end of the Pasteur pipette is sealed by flaming the tip. The resulting glass tip is moistened by gently touching to the agar media, which allows a single seeds to be easily picked up and transferred to the surface of the agar in the wells of the Seedling Plate. A double-headed version of this seed plating tool can also be used to increase throughput. Cover each Seedling Plate with a clear plastic lid and seal with Micropore surgical tape. Wrap the stacked plates with aluminum foil and store Arabidopsis seeds at 4°C for four days to stratify the seeds and synchronize germination. Tomato seeds should be stored in the dark at 12°C for four days. Place the Seedling Plates under fluorescent light at 18° to 20°C to initiate germination. After the Seedling Plates have been under light for four days, transfer the Seedling Plates to the Ice-Cap fountain. For Arabidopsis, the seedlings are typically left in the Ice Cap fountain for 10 to 14 days. Assemble the Ice-Cap Fountain by placing a cookie sheet on top of the custom rack structure which has been placed inside a plastic storage box. Use the leveling nuts to adjust the level of the cookie sheet. Place a submersible pump in the storage box and attach the output hose from the pump to the side of the cookie sheet using a spring loaded clamp. Assemble the Ice-Cap Fountain on a shelf in the plant growth room or growth chamber so that the surface of the Ice-Cap Fountain receives direct fluorescent lighting. Fill the Ice-Cap Fountain with a mixture of 3 parts distilled water to 1 part tap water. Water should be added to the fountain until the submersible pump is several centimeters below the water level. Mark the final water level in the plastic storage box using lab tape and a marking pen. Prepare Root Plates by adding one 3/32-inch diameter stainless steel ball to each well of a Root Plate. The stainless steel balls can be added to the Root Plates using a custom made ball dispensing device 1. This device is made by placing a single sheet of aluminum foil over the surface of a 96-well PCR plate and using a marking pen to mark the locations of the centers of each well on the surface of the foil. This marked sheet of foil is then placed on top of an additional 6 sheets of aluminum foil and wrapped around the smooth surface of a lid from a used pipette tip box. A sharp tool such as a wooden skewer is then used to create a divot large enough to hold a single metal ball at each of the 96 positions. To fill this dispensing device with balls, an excess of metal balls is poured over the device and it is gently shaken to remove excess balls. The Root Plate is then placed over the top of the dispensing device, which is flipped over to drop one ball into each well of the Root Plate. Add 340 microliters of a mixture of 3 parts distilled water to 1 part tap water to each well of the Root Plate using the MicroFill machine. Make sure that the steel balls have been added to the Root Plates before dispensing the water. Peel the adhesive film off the bottom of the Seedling Plates and remove the clear plastic lids from the plates. Place each Seedling Plate in a Root Plate containing a metal ball and water and secure the two plates together using two elastic hair bands. Place the stacked Ice-Cap plates in the Ice-Cap Fountain. The clear plastic lids should not be used when the plates are in the Ice-Cap Fountain. Check to make sure that well A-01 of the Seedling Plate is aligned with well A-01 of the Root Plate. The stacked Seedling/Root Plates should be left in the Ice-Cap Fountain until the majority of the seedlings have root tissue that has penetrated into the Root Plates. The ideal growth temperature for Arabidopsis seedlings in the Ice-Cap Fountain is ca. 18°C. The water level in the cookie sheet should be such that water can flow into the wells of the Root Plates, but not so deep that the seedlings in the Seedling Plate are submerged. If the water level is not correct you will need to get a different cookie sheet of the correct depth. Add distilled water periodically to the Ice-Cap Fountain to maintain the original water level. By adding pure distilled water to the fountain you will replace the liquid lost due to evaporation without changing the mineral composition of the water in the fountain. Water level should be checked daily in the Ice-Cap Fountain. Root tissue is harvested by freezing the water in the Root Plate and then peeling the Seedling Plate away from the Root Plate. The day before harvesting root tissue, remove the stacked Ice-Cap Plates from the Ice-Cap Fountain. Insert three wooden skewers between the wells of the stacked Seedling and Root plates. The purpose of the skewers is to raise the nibs of the Seedling Plates out of the wells of the Root Plates in preparation for the freezing process. Allow the stacked Ice-Cap Plates with wooden skewers inserted to stand overnight under lights. This incubation allows slight evaporation of the liquid in the Root Plates, which facilitates the subsequent freezing and plate separation processes. On the day of tissue harvest, prepare a freezing bath. Place a 96-well metal thermal block in a pyrex dish with mixture of dry ice and 95% ethanol. Allow the thermal block to equilibrate in temperature for ca. 20 minutes. Place the Pyrex dish on top of some type of insulating material such as an autoclave mitten so that the low temperature does not damage the surface of the lab bench. Place the stacked Ice-Cap plates with the wooden skewers into the chilled thermal block and incubate for 5 minutes. During this time the water in the Root Plate will freeze solid. The seedlings in the Seedling Plate do not freeze during this treatment and remain fully viable. Remove the stacked Ice-Cap plates from the thermal block and place them on the lab bench at room temperature. Remove the elastic bands and the wooden skewers from the stacked plates. Firmly press down on the top of the Seedling Plate to "crack" the plates. Then carefully peel the Root Plate and the Seedling Plate apart. Allow the water in the Root Plates to thaw at room temperature. Thawing can be expedited by incubating the Root Plates in a thermal block set at 25°C. Following tissue harvest, the seedling plates can be stored in the dark at low temperature which will maintain the viability of the seedlings while genotype analysis is performed. The seedlings can be stored at these temperatures for several weeks without affecting viability. Following tissue harvest, seal the lower part of the seedling plate with adhesive tape. Place a clear plastic lid on top of the Seedling Plate and secure with micropore tape. Stack several Seedling Plates together and wrap in aluminum foil. For Arabidopsis seedlings, place the plates at 4°C. For tomato seedlings, place the plates at 12°C. Once genotyping is complete, the seedlings can be removed from this low temperature incubation and transplanted to soil as described below. DNA suitable for PCR reactions can be easily extracted from the root tissue samples. The yield of total DNA recovered from Arabidopsis root tissue samples is ca. 400 ng on average 2. Make sure that the water in the Root Plates has completely thawed before performing the DNA extraction procedure. Inspect the plates to determine if any wells have substantially less water than average. Hand pipette distilled water into wells that require additional water. Use the MicroFill machine to add 25 microliters of a Tris-EDTA solution (500 mM Tris, pH 8; 50 mM EDTA, pH8) to each well of the Root Plates. Seal the wells of the Root Plates using thermal sealing foil and a heat sealing machine. Place the sealed root plates on the GenoGrinder machine with the sealed end of the plates facing down. This plate orientation provides optimal bead movement and prevents the beads from sticking in the wells. Shake the plates in the GenoGrinder for 3 ½ minutes at 1350 strokes per minute. Transfer the plates to a centrifuge with microplate carriers and spin the plates for 10 minutes at 3500 RPM at 4°C to pellet the pulverized root tissue. The resulting diluted extract contains genomic DNA that can be directly used in PCR reactions. Typically one will add 2 microliters of this DNA extract to a PCR reaction. For storage of DNA samples, seal the microplate using adhesive packing tape and place at minus 20°C. DNA samples can be stored for several months with no apparent reduction in quality. Once genotype analysis is complete, seedlings with the desired genotype can be transferred from the Seedling Plates to soil. Remove the Seedling Plates from cold storage and prepare pots with water-saturated soil mixture. To remove an individual seedling from the Seedling Plate, use a forceps that allows one to grab the agar plug without crushing the seedling. Grab the agar plug with the forceps and gently slide the agar plug out of the Seedling Plate being careful not to damage the seedling. Alternatively, pressurized air can be used to gently shoot the agar plug and seedling out of the well. Apply pressure to the small hole in the bottom of the well until the plug pops out onto the lab bench. Prepare a small hole in the soil the size of the agar plug. Place the agar plug in the soil and pack moist soil around the agar plug to secure the seedling in the soil. Do not attempt to remove any of the agar from around the seedling. Place the transplanted seedlings in a growth room under standard growth conditions. Cover the pot with a plastic lid for the first two days after transplant. Subsequently remove the lid and continue to grow the plants using standard conditions. 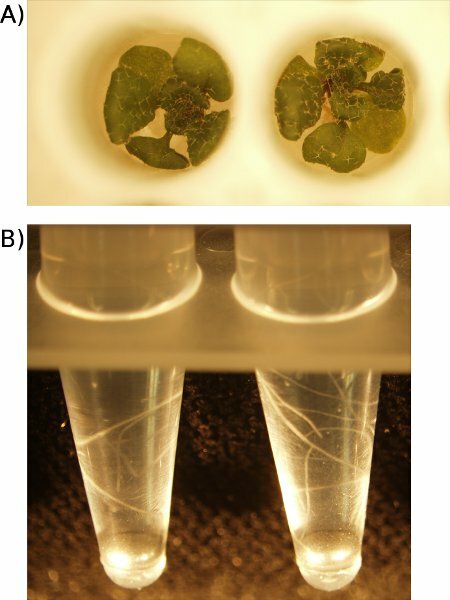 An example of Arabidopsis seedlings grown using the Ice-Cap system is shown in Figure 4A. These seedlings had been in the Ice-Cap fountain for two weeks when the picture was taken and were ready for tissue harvest. Root tissue from these same seedling is shown in Figure 4B. The total amount of DNA extracted from one sample of Arabidopsis root tissue is typically in the range of 100 ng to 700 ng 2. This yield calculation is based on the use of only one portion of the crude root extract. Because only ca. 10% of the crude root extract is typically used for the DNA extraction process, it is possible to obtain significantly more genomic DNA for downstream analysis by retaining more of the crude extract. The total amount of genomic DNA obtained using the Ice-Cap procedure is sufficient to perform hundreds of PCR reactions 2. Figure 1: Flow chart of the Ice-Cap process. A) Seedling Plate containing agar growth media on which seedlings germinate. Roots penetrate the agar and grow down towards the bottom of the plate. Holes in the bottoms of the wells of the plate are sealed with adhesive film. B) The Seedling Plate is stacked on top of a Root Plate containing water and a metal ball. Roots exit the holes in the bottoms of the wells of the Seedling Plate and grow into the wells of the Root Plate. C) Wooden skewers are inserted between the Seedling Plate and the Root Plate the day before the stacked Ice Cap plates are placed in a thermoblock in a dry ice/ethanol bath. D) Once the water in the Root Plate has frozen solid, the Seedling Plate is peeled away from the Root Plate, yielding a Root Plate with 96 tissue samples and a Seedling Plate with 96 viable seedlings. The wooden skewers facilitate the separation of the two plates during this step. Figure 2: Photographs of a Seedling Plate and a Root Plate. A) A Seedling Plate and a Root Plate seen separately. B) A Seedling Plate stacked on top of a Root Plate. The steel balls used for DNA extraction can be seen in the wells of the Root Plate. Elastic bands are used to secure the two plates together. Figure 3: The Ice-Cap Fountain. The Ice-Cap Fountain is used to maintain a constant water level at the precise height of the tops of the wells of the Root Plates. This continuous watering system ensures that the water in the wells of the root plates does not become depleted due to evaporation or transpiration. A) A home-made rack that supports the cookie sheet on which the stacked Ice-Cap Plates sit. B) A close-up view of one of the 1" nuts that provides a means for precisely adjusting the level of the cookie sheet so that a uniform water depth is achieved across the surface of the fountain. C) This image displays all of the parts needed to construct the home-made rack for an Ice-Cap Fountain. D) The assembled Ice-Cap Fountain. A submersible fountain pump constantly moves water from the lower reservoir to the cookie sheet, which rests on top of the home-made rack. A spring loaded clamp is used to attach the hose to the edge of the cookie sheet. Figure 4: Arabidopsis seedlings grown using the Ice-Cap process. A) Top view looking down into two wells of a Seedling Plate. Each well contains an Arabidopsis seedling. B) Side view of two wells of a Root Plate. Roots can be seen twisting around the inner surface of the wells. The seedlings in this picture had been in the Ice-Cap Fountain for ca. two weeks and are at the growth stage where tissue harvest would normally be performed. The Ice-Cap method presented here enables one scientist to collect tissue samples from hundreds, or even thousands, of individual plants in a single day and efficiently extract genomic DNA from those samples for use in genotyping reactions. By giving an individual scientist the ability to genotype thousands of seedlings in a short period of time, the Ice-Cap method has the potential to facilitate a number of genetic experiments that would not otherwise be practical to perform. Several examples are provided below. Genetic Mapping. Fine-scale genetic mapping can be expedited if the researcher is able to identify recombination events within a specific interval along the chromosome 3. If this interval involves a very short genetic distance, then the recombination events will be relatively rare in the segregating mapping population. For this reason, it may be necessary to screen thousands of individual plants to find the desired recombinant individuals. This process could be greatly expedited through the use of Ice-Cap. Even in the era of genome-wide re-sequencing, it is still necessary to directly demonstrate that a given mutation is directly responsible for a phenotype of interest. In these cases, it will be necessary to segregate the mutation of interest away from other closely linked mutations in order to prove a candidate mutation is actually causative. In these situations, Ice-Cap would provide an efficient method for breaking linkage between a pair of tightly linked mutations. Multi-mutants. It has become common for researchers studying Arabidopsis to combine mutant alleles from several distinct loci into a single individual in order to overcome functional redundancy 4-6. As an example, consider a case where one wishes to combine mutant alleles from four different loci into a single plant through genetic crossing. For this project, it will be necessary to generate an individual that is heterozygous at these four loci as part of the crossing scheme. When this quadruple-heterozygote sets seed, the quadruple homozygote is expected to be present at a rate of one out of 256 in the resulting population of progeny. Screening for this rare individual by traditional methods would be quite labor intensive. By comparison, using Ice-Cap for this project would provide the scientist with an efficient strategy for identifying the rare quadruple homozygote in a single generation. iTILLING. Our laboratory recently described a novel approach to screening for the presence of induced mutations in genes of interest in Arabidopsis 7. This method is a variation on an established technique called TILLING that is used to find mutations in ordered populations of individuals treated with a chemical mutagen 8-10. We have named our method iTILLING because it is an individualized version of TILLING that allows an individual scientist to accomplish something that has traditionally required a large research team to complete. Ice-Cap forms an integral part of the iTILLING method 7, as described below. The idea behind iTILLING is to produce an ephemeral mutant population, which stands in contrast to the durable mutant populations created for traditional TILLING projects. For iTILLING, seeds from a bulked M2 population are sown into 50 to 100 Ice Cap blocks, and DNA is extracted using the Ice-Cap method. Arabidopsis seedlings are then placed at 4°C while mutation screening is performed using the Ice-Cap DNA preps. Tomato seedlings are stored at 12°C.. Once seedlings carrying desired mutations have been identified, they are recovered from the Ice-Cap plates and transferred to soil. iTILLING is not intended to provide a long-lasting mutant population for an entire research community to screen. Instead, iTILLING provides a strategy by which one scientist can screen a custom mutant population for mutations in a handful of genes quickly, efficiently, and at a relatively low cost. We have found Ice-Cap to be an effective method for growing and genotyping Arabidopsis, tomato, and rice. We expect that other species of plants should also be amenable to Ice-Cap. One limitation on the variety of species that can be accommodated by Ice-Cap is the size of the seeds. Only plants with seeds small enough to fit into the wells of a 96-well plate will be compatible with Ice-Cap in its present configuration. This work was funded by a grant from the National Science Foundation (grant number MCB-0447750). 33 Liter plastic storage box Target Department Store Sterilite Brand For Ice-Cap Fountain. Fisher Scientific Nunc brand, 1-mL filter plates without frit Fisher Scientific 278012 96-well Seedling Plates with holes in bottom. Pyrex baking dish (20 cm x 30 cm) Target Department Store Used to construct a dry ice/ethanol bath. Clark, K. A., Krysan, P. J. Protocol: An improved high-throughput method for generating tissue samples in 96-well format for plant genotyping (Ice-Cap 2.0). Plant Methods. 3, 8-8 (2007). Krysan, P. I. ce-cap A high-throughput method for capturing plant tissue samples for genotype analysis. Plant Physiol. 135, 1162-1169 (2004). Jander, G. Arabidopsis map-based cloning in the post-genome era. Plant Physiol. 129, 440-450 (2002). Liljegren, S. J. SHATTERPROOF MADS-box genes control seed dispersal in Arabidopsis. Nature. 404, 766-770 (2000). Buechel, S. Role of A-type ARABIDOPSIS RESPONSE REGULATORS in meristem maintenance and regeneration. Eur. J. Cell. Biol. 89, 279-284 (2010). Krysan, P. J., Jester, P. J., Gottwald, J. R., Sussman, M. R. An Arabidopsis mitogen-activated protein kinase kinase kinase gene family encodes essential positive regulators of cytokinesis. Plant Cell. 14, 1109-1120 (2002). Bush, S. M., Krysan, P. J. iTILLING: a personalized approach to the identification of induced mutations in Arabidopsis. Plant Physiol. 154, 25-35 (2010). Comai, L., Henikoff, S. TILLING: practical single-nucleotide mutation discovery. Plant J. 45, 684-694 (2006). Henikoff, S., Till, B. J., Comai, L. TILLING. Traditional mutagenesis meets functional genomics. Plant Physiol. 135, 630-636 (2004). McCallum, C. M., Comai, L., Greene, E. A., Henikoff, S. Targeting induced local lesions IN genomes (TILLING) for plant functional genomics. Plant Physiol. 123, 439-442 (2000).